Bioanalysis Zone is delighted to offer its members unique access to two panel discussions. The panel discussions focus on two current issues facing the bioanalytical field: new technology integration in bioanalytical workflows and the sharing of scientific data. The series focusing on new technologies features conversation between Scott Summerfield (GSK), Roger Hayes (MPI Research), Meina Liang (MedImmune), Lina Luo (Pfizer), Ian Moore (Sciex), Afshin Safavi (BioAgilytix) and Dominic Warrino (KCAS). We thank our contributing experts for their time and thoughtful contributions and hope that through having these open discussions, together we can progress the field of bioanalysis. Roger Hayes, PhD, is Senior Director, Laboratory Sciences at Charles River Laboratories (MA, USA). Most recently he was Senior Vice President, DMPK, at MPI Research (MI, USA). Before joining the MPI Research in 2011, Dr Hayes has held numerous leadership positions in the global life sciences industry and academia, leading teams in the development of state-of-the-art bioanalytical and analytical techniques, including mass spectrometry, chromatography, and automation in bringing medical and chemical products to market. For nearly 2 decades, he has led strategic and research initiatives for large pharmaceutical companies that included both GLP and non-GLP preclinical studies as well as clinical trials. At Merck Research Laboratories, Dr Hayes directed the regulated bioanalysis group in support of preclinical and clinical safety trials and also advanced efficiencies for method development and validation. At Parke-Davis Pharmaceuticals (MI, USA), he managed the instrumentation support department, headed the bioanalytical groups for both safety and discovery research and did cutting-edge work as the leader of the drug metabolism mass spectrometry group. Prior to that, Dr Hayes spent several years at Procter and Gamble (OH, USA), where he developed new analytical technology and processes. His career is rooted in academia, beginning at the University of Adelaide in Australia, where he received his PhD in 1985 and performed innovative research in gas phase ion chemistry. From there, he went to the University of Nebraska-Lincoln (NE, USA), where he served as an assistant director/assistant research professor and continued his groundbreaking research, with an emphasis on advancements in the use of mass spectrometry. Most recently, he served as President of Bioanalytical Operations, at Cetero Research (ND, USA) where he focused on establishing overall corporate direction for bioanalytical and analytical services. Dr Hayes has published extensively and has taught numerous aspects of LC–MS method development. He is an active member of the American Society for Mass Spectrometry and the American Association of Pharmaceutical Scientists. Ian Moore is the Technical Product Manager for the nominal mass product line. Ian started his career at SCIEX (ON, Canada) in 2012 as an Application Scientist with the Product Application Team in Concord. While part of the product application team, Ian contributed to the development of a diverse set of products in the role of Lead Customer for DiscoveryQuant software and as development scientist and validation lead for the BioBA peptide quant solution. 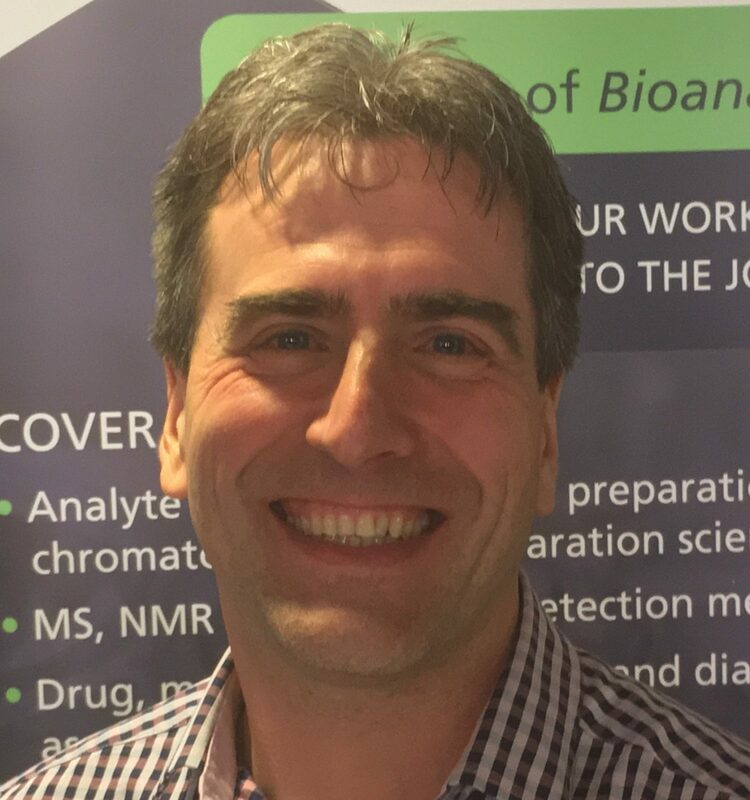 In 2016, Ian joined the Business Unit as Technical Marketing Manager for Pharma Quant and MetID, and supported the commercial and marketing organizations through the generation of scientific content focusing on signature peptide and small molecule quantitation, and MetID to support the launch of MetabolitePilot 2.0 software and the Biotransform Solutions. Prior to joining SCIEX Ian worked for 7 years in the pharmaceutical industry as Lead Analytical Scientist at Custom Biologics (ON, Canada) (A provider of GLP compliant contract lab services specializing in the development and validation of bioanalytical assays) and Senior Scientist at Affinium Pharmaceuticals (A pharmaceutical company focused on clinical development of antibiotics). Ian received a BSc in Chemistry from Western University (ON, Canada) and MSc and PhD in Chemistry from The University of Toronto (ON, Canada). Dr Afshin Safavi is a veteran biochemist with extensive experience establishing and leading bioanalytical teams in pharmaceutical, biotechnology, and manufacturing companies, as well as contract research organizations. He and his teams have supported the development of a broad range of therapeutics in preclinical and clinical-trial laboratories.Prior to founding BioAgilytix (NC, USA), he was the Director of Ligand Binding and Immunoassay at AAIPharma (MA, USA). At Talecris BioTherapeutics (NC, USA), he led the Preclinical and Clinical Assay Development team, building on his experience as a senior scientist at Nobex Corporation (NC, USA), GlaxoSmithKline (NC, USA) and IGEN International (NC, USA). Dr Safavi is considered an expert in the areas of immunoassays and biomarkers, with a wide working knowledge of various immunoassay platforms. He obtained his BS in Biochemistry from UCLA (CA, (USA), his PhD in Biochemistry from the University of Kentucky’s Medical School (Department of Biochemistry; KY, USA), and he completed a two-year postdoctoral assignment at Emory University’s Department of Pathology (GA, USA). Dr Dominic Warrino is the Senior Scientific Advisor at KCAS (KS, USA) for large molecules. Dominic joined the company in 2013, and brought with him expertise in a full range of bioanalytical techniques including ECL, ELISA, RIA, Flow cytometry, ELISpot, cell based assays and Luminex. He also serves in business development as technical consultant. Dominic has 20 years of experience developing and validating immunological assays for biotechnology and pharmaceutical companies. He most recently spent the past several years in the Biopharma Services department at Viracor-IBT (formally IBT; MO, USA). Dominic has worked for Cytogen (formally Cellcor; NJ, USA), Eligix, and Streck Laboratories (NE, USA) developing novel compounds for treatment of various cancers. He has worked on over 100 large molecule compounds developing and validating PK, PD, ADA, and Biomarker assays in support of preclinical to Phase IV testing. Scott is a Senior Director and head of small and large molecule Bioanalysis at GSK (Brentford, England). Having completed a PhD and post-doctoral fellowship in proteomics at the University or Warwick (Coventry, England), Scott started in the pharma industry in 1997 as a bioanalyst. In subsequent years Scott has assumed a number of line and matrix leadership roles covering bioanalysis, neuroscience research and DMPK project leadership within drug discovery and development. Dr Meina Liang has broad experiences in drug development of small molecule and biologics across therapeutic areas, including antibody-drug conjugate and immunotherapy. Dr Liang is currently director of Clinical Immunology and Bioanalysis at Medimmune (CA, USA), a subsidiary of AstraZeneca. She leads a centralized functional group supporting Medimmune portfolio from preclinical to post marketing, responsible for biomarker development for pharmacodynamics and patient stratification, pharmacokinetics bioanalysis for exposure-response evaluation, in vitro cytokine release testing for safety assessment and immunogenicity analysis for regulatory submission. Her group also contributes to investigation of mechanism of action and lead selection of candidate drugs as well as development of companion diagnostics. Dr Liang manages a GLP laboratory and also plays a DMPK project leader role for safety studies and clinical trials. She contributes to global regulatory interactions and submissions, including INDs, CTAs, IMPDs and BLAs. Prior to joining Medimmune, Dr Liang was a senior scientist at Abgenix (CA, USA), leading a centralized antibody-screening group for lead selection and characterization of therapeutic antibodies. Before Abgenix, Dr Liang was a scientist at Berlex Biosciences (CA, USA), supporting small molecule drug discovery and development and played a key role in advancing a chemokine project from concept to clinical trials. Dr Liang holds BS in Pharmacy from Peking University Medical School in China and PhD in Pharmacology from University of North Carolina at Chapel Hill (NC, USA). She received postdoctoral training from University of Virginia (VA, USA). Dr Liang is a co-inventor for a number of patents, has published numerous articles in peer-reviewed journals and has been invited to present at many international conferences. Lina Luo is working as a team lead in the Pfizer Global non-regulated bioanalytical group (CT, USA) with a focus on bioanalysis of clinical transporter biomarkers and preclinical PK/TK support for small molecule drug candidates. Lina obtained her BS degree in Chemical Engineering from Nanjing University of Science and Technology (China) and her MS in Analytical Chemistry from the University of Kentucky (KY, USA) in 2002. She worked as a scientist in Vector Research in Research Triangle Park, NC, USA from 2002–2004, and then joined Pfizer Drug Safety R&D to support toxicology studies in Biomarkers Department. Her responsibilities included safety biomarker investigation and implementation to support preclinical projects and assessment of biomarker translatability to clinics; program de-risking assessments and efforts on drug safety issues for regulatory applications. She is a member of the Predictive Safety Testing Consortium (PSTC) Working Group and a Pfizer representative for biomarker co-development across companies and regulatory agencies.